I had to look after my 3 (and a bit) year old grandson all day yesterday and to be frank it is hard going! After giving him some breakfast and getting him changed out of his pyjamas we settled down to a game of ‘Lego’ – which consists of two enormous bags about the same size as him, full of all kinds of Duplo Lego that has been collected over the lifetime of my 4 children and that of my 3 grandchildren…so there are lots of bits, many and various, and always in a muddle! Of course, with that amount of material to play with the only place to play was the floor – so I had to lower my ‘ancient bones’ downwards to meet Dylan on his level. We built a Doctors’ Surgery – complete with a toilet in the middle of the waiting room…(hmmmmm – not my idea I might add!…) and we built a shop after transporting all the bricks for it around the room on a long Lego train. We chased a ‘naughty man’ – dressed in a black and white striped shirt all around the room with a black police car and a white motor bike, both driven by policemen, and incarcerated him back at the jail…after we had evicted the giraffe, sea lion, pig, horse and polar bear! We then went on to perform motorbike stunts and tricks which ended up as motorbike missiles so that had to stop! We were down there so long making up stories of one kind or another that my supporting arm and hand froze into position so that when it was time to go and do something else….”cumman play a me naneeee”… I could barely get up off the floor and couldn’t do anything with my left arm – barely even straighten it – for about 5 minutes! 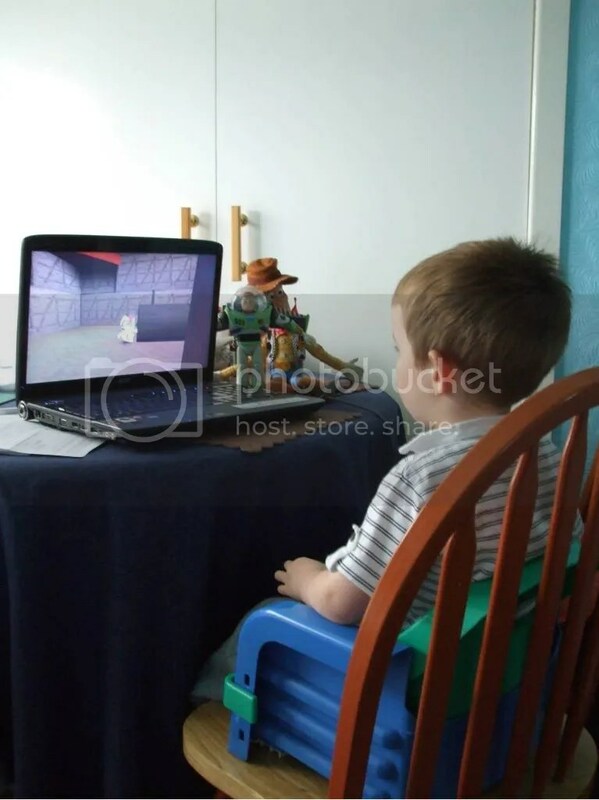 After lunch – which was a battle of wills based on whether he likes cheese or not an if I had toasted the bread to the right shade – my son, who was passing through, set up his laptop with a Toy Story game loaded onto it and gave Dylan the X Box style controls. I didn’t think this was such a good idea – after all, he is only 3….. But I was flabbergasted to see how deftly he manoeuvred Buzz Lightyear around Andy’s Home. Up and down stairs, in and out of rooms. “Nanneee.. I wanna go ona greeeen stuff wida blooo fing…..help me nanneeeee….” Oh, Dear! Now I did try….I tried very hard – but all I could do was make Buzz go round in rather dazed and convoluted circles before making him plunge off a wall and eventually keel over backwards – dead! Dylan seemed to be rather stunned with my lack of ability to get Buzz to even walk a straight line – let alone find ‘da blooo fing’ which would allow him to go ‘ona greeeen stuff’. By this point I was helpless with laughter…Dylan couldn’t see the joke and just looked resigned and pityingly at me! Yep!… that’s the same look I get from my adult sons!! Later I taught him how to fly paper aeroplanes (made by my younger son as mine wouldn’t fly…) and we both got thoroughly worn out running up and down the room to collect them. Thank heaven he finally went to sleep…and yes, so did I! I learned a lot about my 3 year old grandson yesterday, and the speed of his development…and I think he learned a lot about me, and my limitations!! Yes, there is definitely a generation gap….the secret is not to mind it!